While we fight every day for the thousands of nameless horses who are still free on the range, we are reminded by our beloved sanctuary residents that these thousands are made up, not only of precious individuals, but by family bands and herds they have created through their complex and ancient social culture. When we at Return to Freedom not only save individuals, but are successful at relocating and/or reuniting them with their lost loved ones, it renews our fighting spirit to better tackle the difficult work ahead. Looking back at 2016, we are grateful that — with your help — we have been able to restore joy and purpose to a number of our horse friends by locating and rescuing some of their family members from whom they were heartlessly separated during brutal and ruthless roundups which had torn their worlds apart. It gives me such pleasure to update you here on some of these small, but wonderful miracles you’ve helped us to achieve. I hope you are inspired, as we are, to work together this year to do much more. Cold Creek herd member Shiloh awaits rescue by RTF. Photo by Victory Tischler-Blue. This year, with your help, we were able to locate and select 10 horses who were regularly photographed roaming together in The Cold Creek area on the edges of the Wheeler Pass Herd Management Area (HMA) outside of Las Vegas, Nevada. After four years of drought, the herd was stressed and malnourished. 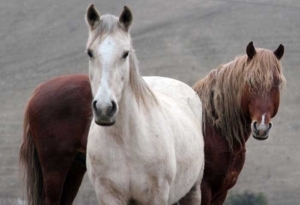 In the fall of 2015, the 10 horses were among 201 horses removed from the wild by the Bureau of Land Management (BLM) for rehabilitation at a Utah ranch. We were able to arrange for the devoted photographer to identify the 10 horses and help us relocate them to our sanctuary this summer. Today, they roam on our 2,000 acres in Central Coastal California’s rolling hills. This rescue was made possible only with your help and the generous donors who offered their lands to the horses. Thank you! Sarge reunites with his beloved mare, Promise. Photo by Irene Vejar. Sarge, a band stallion who loyally fought to keep his family together year after year, was part of a herd living in the Fish Creek area outside Eureka, Nevada. In the long conflict between special interests and advocates who love horses, Sarge was uprooted again and again. As a baby, he was removed from the range without permission, and then dumped back on the range, alone, two years later. 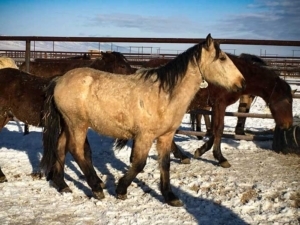 Then, due to a standoff with a cattle rancher to prevent 200 mares from being returned to the range as part of a viable population management program, Sarge eventually lost his loyal lead mare and his herd, and he himself was eventually offered up for adoption. By then, 15-year-old Sarge was something of a poster horse for what was wrong with the system. After a long struggle with the powers-that-be, a wild horse advocate determined to send Sarge to Return to Freedom was successful! Thanks to this devoted advocate who had documented these horses on the range, we were able to identify and track down Sarge’s lead mare with whom he shared such a unique and special bond. We named her Promise. Can you imagine how our hearts soared as we watched Promise recognize him after all that time and all they’d been through? Thanks to your help, and horse defenders like you, Sarge and Promise are together again and inseparable. She remains very protective of Sarge and even possessive of him with his other two mares. Sir Galahad reunited with his mare, Hope. Photo by Josephine Blossfeld. In the legend of King Arthur, Galahad was known as the “Perfect Knight”; he was the very picture of nobility, purity, courage, gentleness, courtesy, and chivalry. It was Galahad who found the Holy Grail. 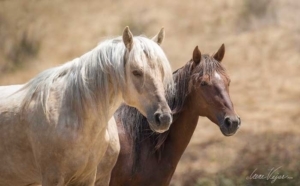 For these reasons, it is the name given to a heroic flaxen-maned chestnut stallion when he and his family were captured in 2010 from the Silver King Herd Management Area in Nevada’s Great Basin. Stampeded by deafening helicopters and chased relentlessly over dangerous terrain, Galahad’s lead mare, Hope, the queen of the herd, sustained a severe facial wound. Galahad and his mares and foals were forced into a trap at the capture site where they were held in a pressure-cooker situation with two other bands in the same small enclosure. For five hours, Galahad bravely fought off other stallions to protect his injured mare and their colt — but he lost the rest of his family as a consequence of his dedication to his one ailing mare . . . only to lose her anyway to the system. Galahad’s story clearly shows us the strong emotional bonds that exist in relationships between horses. Even in the trap that robbed him of his freedom, he gallantly lived up to his famous Knight’s name. What Galahad could not know, as he paced and fought and defended his mare in that trap, or as he was seemingly forever separated from his world, was that an unseen army of caring and dedicated people — including you! — were already ceaselessly at work to roll back the injustice as far as was possible until the injustice could be stopped forever. Thanks to the support given to our work by concerned people all over the world, we found a way to undo one terrible wrong: The otherwise tragic total loss of Galahad’s family. But a determined ally followed Galahad to his holding pen, where the brave horse stuck very close to a white stallion named Silver King. His human protector alerted Return to Freedom (RTF) and we were able to get possession of both Silver King and Galahad. RTF then tracked down Galahad’s cherished mare, Hope, and his beautiful, curious son, Sterling, and moved them to safety. When Galahad spotted his family on the other side of the facility, he ran to greet them with excited cries of recognition. We were able to reunite Galahad, Hope, and their colt. 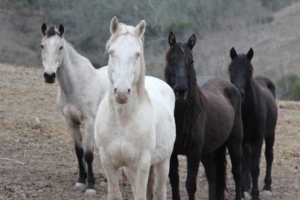 Against all odds, the trio is safe — along with two other bay mares Galahad lost in the roundup — at our American Wild Horse Sanctuary. Silver King reunites with Grace and the rest of his harem of mares. Photo by Josephine Blossfeld. Silver King, Galahad’s friend throughout their capture, is also a mature harem band stallion rounded-up with his family in 2010 from Nevada’s Silver King HMA. Stampeded by deafening helicopters, Silver King and his herd were chased relentlessly over dangerous terrain and into an inescapable trap. Silver King and his mares’ heart-wrenching screams echoed as they saw their world and each other disappear through the cold metal bars of the holding pens. Like Galahad, what Silver King did not know as he fought, defended himself, and was loaded onto a crammed trailer to be hauled from his home range, his freedom and his world, was that there were still caring people determined to protect him and his family. Return to Freedom — and our loyal supporters — will always to do what we can to ”save the pieces”. We are proud and happy to tell you that we eventually reunited Silver King with his mare, Grace — and a few others from his band. Thanks to the generous support given to our work by caring people all over the world, we found a way yet again to undo another terrible wrong: The total shattering of Silver King’s precious family. 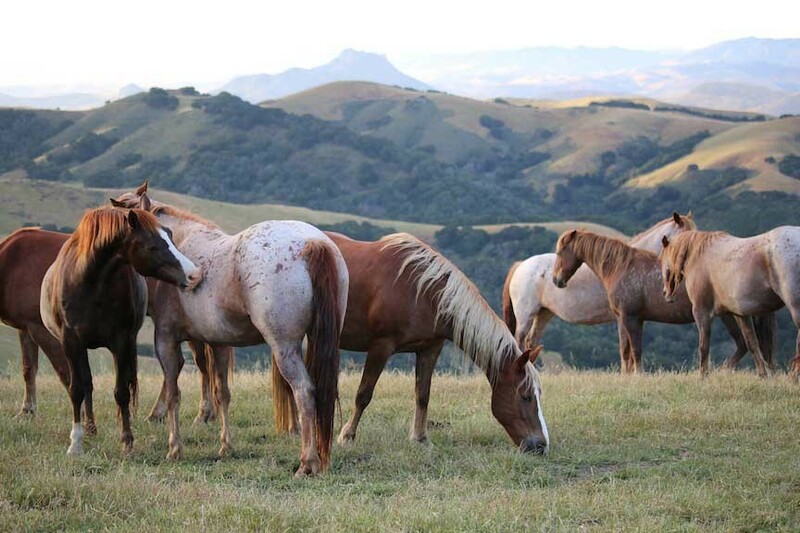 Silver King’s colt, Haiku, and Galahad’s colt, Sterling, also joined their fathers at RTF’s sanctuary. Baring witness to these reunions is exactly like watching a family find each other after frantically and forcefully being separated by battle. I wish you could have been here to witness the way each of these horses recognized and reunited with their loved ones. Hope stood by Galahad for hours, first their noses recognizing each other’s breath, then her nose traveling very slowly up and down each side of his face. The mare has had a calming affect on Galahad who still, after six years, snorted and ran when staff came into the pasture to feed hay. Now together, you can see that they feel strong, protected, and balanced. We never forget for a minute the crucial part you play in these small miracles. Thanks to our colleagues, staff, and volunteers who have photographed these horses on the range and during roundups, we are sometimes able to save the pieces. Alone, we are small. Together, we are a giant force for good. Let’s do even more good—together—in the coming year. Consider a gift that helps us reunite wild horse families all year long. P.S. These joyful reunions and the work we do to keep wild horses free is only possible with your help. Please stand strong with us this year as you have in the past. I thank you silently, but warmly every time we jointly achieve these happy victories. And please stay tuned for more photos!